We had a mother of a drought in July of this year. We went almost 6 weeks without rain-which meant daily irrigation of our gardens-even the established perennials needed a weekly hit. We have 5 oak rain barrels on property which will hold about 300 gallons but that was soon drained and we were taking from the local city water to irrigate our permaculture plot which rankled me as it went straight against my “zero input” plan. 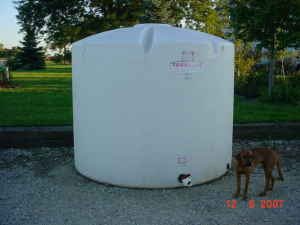 I am guessing the dog doesn’t come with, but 2000 gallons with the drain aready installed for $200 seems like a steal. I have no idea how I would support the base (we are talking 16,000 lbs of water!) and I would need to surround it with something lest the neighbors mutiny but I am pretty stoked. If I can work out the logistics of tranporting it here this just might happen. July had less than an inch of rain, thus far in August we are over 14 inches in Johnson Creek, with parts to the West of us in Wisconsin getting hit hard. We spent much of the week reading account after account of the devastation-focusing in especially on our local Organic Farmers which after overcoming the odds by eking out an existence as Sustainable Farmers were being blasted by the whims of fate and possibly the far reach of Global Warming. Our preferred source for veggies that we don’t grow is Harmony Vally Farm, a large organic farm NW of Madison in the heart of the “organic valley” of the Kickapoo River made famous by Organic Valley Dairy. Harmony valley took 12 inches last weekend, to make 17 inches in one week. Losses are expected to exceed $300,000 dollars in gross sales. Far more disconcerting is the state of the fields as the floods recede-the topsoil is gone and a gravel sludge now resides in its place. Back to that $300k number-this isn’t agribusiness-I have met the farmer and his stand is full of 20 to 30 somethings that he is teaching to farm sustainably, and also paying fairly for their labor. 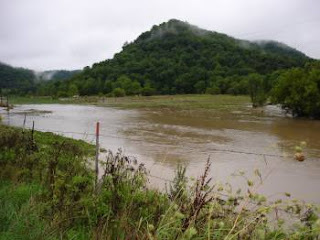 Luckily half of his farm is above the floods, so the damage is not total. When we stopped out today to buy onions and brassicas (gone due to flooding) we gave the clerk 2 twenties for the $18 bill. When he tried to hand one back-we told him we had read about the floods and that having them at the market every week was very important to us-enough that $2/ea for onions seemed pretty darn fair to us. Here at the Beo suburban farm, the tomato crop was set back by 3 weeks as tomatoes split so fast it was almost comical-at least Mia was able to put up 9 pints of sauce last week before the deluge. The melons are a little watery, and the corn has all fallen over. But the new rock walls around the garden beds have held firm so the fall crops of lettuce, beets, and carrots are coming in strong-if one braves the mosquito swarms to check on them. Started pricing garlic bulbs and potato “seeds” today in preparation for the Business Plan on the Prairie Dock acreage. Not sure if I have a market for 3000lbs of heirloom potatoes, but am willing to look! The Insight’s payload capacity is 250lbs…. So here are some of the latest and greatest for our little Village as it becomes more Green. 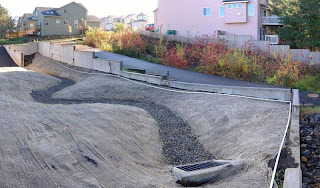 1) Stormwater. We will be submitting a request for proposals to implement our Water Resource Management Plan now that we have secured the grant. This would be a Drainage Plan in other communities, but we are looking to treat our water not as a problem to send downstream, but as a resource that is absolutely vital to everything from, well, living, to commercial enterprises as varied as agriculture, textiles, and your local car wash. One of the coolest things that we want to see come out of this is the installation of a Stormwater Utility. That’s right, we will be taxing runoff as well as sewer. You put up a big Discount Retail store and a 1000 car parking lot and you will be helping us monthly to readjust our watershed to compensate. Or you can install permeable paving, percolation rich detention ponds, and a green roof and you might even get a monthly credit. Same goes for residential. Money talks. Think carbon credits but on a storm sewer level. 2) Community Gardens. I had this added for next month after I became aware that we have 16 acres of what will be a future park rented out to a local farmer. I will be presenting a plant to see about 2-4 of those acres split off into 1/8 acre chunks for the whopping sum of $25/yr to anyone who wants more land. Revenue will go to our Green Committee, and any remaining land that is unused would be donated to the local Master Gardeners who would run a market garden on it to support charities. This would also give us a nice venue for holding regular seminars on things such as composting, organic/biointensive gardening, mulching, xeriscaping, etc. for public education. Biggest concern is that no one is interested in a market garden as 95% of our community has a large backyard. Still if even 5 signed up this would be a win. 3) Sustainability Library. I have posted before that I am concerned that we need to educate our community more on Sustainability issues if we are to Succeed as a Eco Municipality. To that end I will be meeting with our Librarian next week to discuss the feasibility of creating a library section of cross discipline books to help our community learn more about the problems and more importantly the solutions. Hoping to start with at least 20 volumes and have it grow to 100+. With our library being so small, even a small display gets noticed in a hurry so this could generate some buzz. Post a comment with some of your favorite books on Sustainability. Books that gave you an “Aha!” Books that you talked about with family or co-workers. Books that made you change. I will then do my best to get them into our library.